It's not about numerology or anything other than the origins of certain pop culture numbers and numerical phrases, decidedly low brow and accessible. "Hawaii Five-O", "Se7en", "Three Sheets to the Wind" sort of words and phrases...things you don't expect to find interesting, much less fascinating. The book is divided into five sections: Numbers in Language, in Fiction, in Culture, in Math and Science, and in Mythology and Religion. Example: Why did Ray Bradbury name his iconic novel Fahrenheit 451? Likely because that's the temperature at which paper incinerates (his story involves book burning). Or what significance was the number 77 in Sweden in WWII? The pronounciation was so difficult to pronounce, even to a native speaker, that guards at borders used it as a password to distinguish between native Swedes and those trying to cross. Written in a dictionary style within the categories, it's suitable for general reading and for reference purposes. The writer's style reminds me of A.J. Jacobs or Eric Weiner: fast paced and witty. Special thanks to Julie Harabedian at FSB Associates for the Advanced Review Copy. 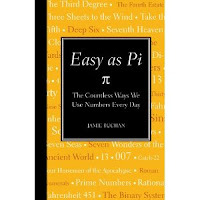 My husband is a numbers geek, I HAVE to pick this one up for him! Thanks for the review!